This is a die-cut flange Pendol Motor Oil porcelain sign. This particular Pendol Motor Oil sign is predominantly white with red and black text. 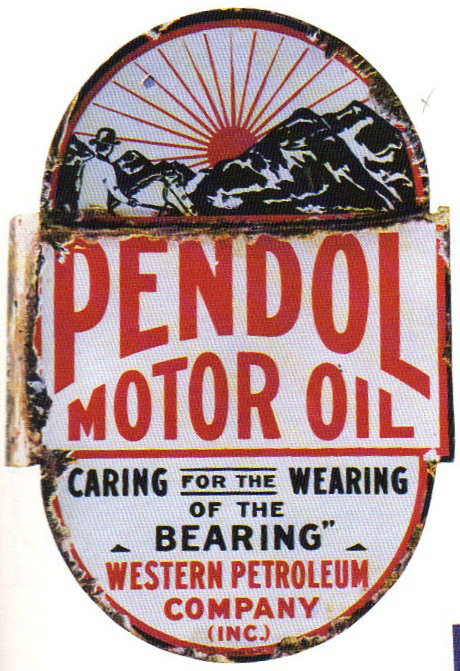 It reads, “Pendol Motor Oil, Caring For The Wearing Of The Bearing, Western Petroleum Company, (Inc.)” and features a man riding a horse towards a red setting sun at the top of the sign.